The Israeli military has carried out strikes on Hamas targets in Gaza hours after a Palestinian rocket struck a house near Tel Aviv. One of the targets hit was a Hamas naval position west of Gaza City, and another was a large Hamas training camp in northern Gaza, Palestinian security officials and Hamas media outlets said. The strikes began around the same time Israeli Prime Minister Benjamin Netanyahu met US President Donald Trump in Washington. Mr Netanyahu immediately threatened a strong response to the rocket attack that had hit a house north of Tel Aviv. The building was destroyed and seven Israelis were lightly wounded from burns and shrapnel. Mr Netanayhu's strong response to a rare long-distance strike came amid accusations from opponents in a closely contested election - to be held on 9 April - that he has been showing weakness in the face of security challenges from Gaza militants. Israel blamed Hamas for the rocket, but a Hamas source denied the Islamist movement, which rules the Palestinian enclave, was behind it. United Nations Secretary-General Antonio Guterres has said he is "gravely concerned" by the recent developments and has called on all sides to exercise maximum restraint, UN spokesman Stephane Dujarric said. "Today's firing of a rocket from Gaza towards Israel is a serious and unacceptable violation. 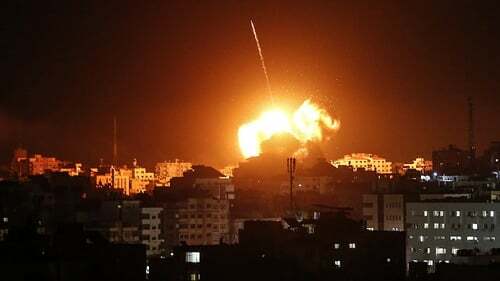 We are aware of the latest reports of firing on Gaza," Mr Dujarric said. "We continue to work with Egypt and all concerned parties to try to de-escalate the situation."